At the outbreak of the war, there were many volunteering meetings. Any single male, over the age of 18 (and strapping lads under age) and under 38 could join up. The men were assigned to a regiment and then sent off for training for a year before entering the theatre of war. All the regiments got their share of people including the specialists – the Engineers, Royal Core of Signals, Marines etc – which is why the records we have of the fallen from Deal are from many regiments and branches of the allied forces. Later on, Lord Kitchener sent a reinforced message calling for more volunteers. However, numbers were dwindling and many more people were needed so, in 1916, conscription was introduced. Later on, the call was extended to married men and, in 1918, the upper age limit was raised to 51. There were exempted groups of people. A huge number of people from all over the British Empire volunteered and made a great contribution to the war effort. The ‘Kent Volunteer Regiment’ (numbering 150 of Deal & Walmer people) were mobilised with the Marines in the trenches Feb 1916, the first volunteer regiment in the UK to stand alongside regular troops. A large proportion of able bodied men left our area but normal work had to go on. Women played a crucial role in maintaining farming, keeping manufacturing, supply chains and businesses running. Additionally, the troops had to be supplied with food and munitions. Women found roles in every walk of life - the greatest social change our country had seen. Servants were a large part of the normal scene at the outbreak of the war and many of these left, leaving their employers to manage as best they could. It was certainly life-changing for those remaining. The Admiralty required all shipping in the channel to come through the Downs for inspection and this caused a great concentration of ships off Deal, 100’s day after day. Damaged vessels (by mine, torpedo or collision) were run ashore off North Deal, patched up then re-floated. The steamer ‘Surrey’ was onshore for three months. The succession of steamers finding asylum off North Deal earned for that part of the coast the nickname ‘the hospital’. Large houses became convalescent homes run by the Voluntary Aid Detachment (V.A.D.). 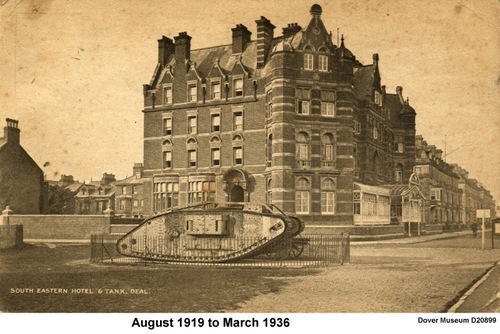 In Deal, many houses were turned over for this purpose collectively called ‘The Grange Hospital’ and comprised The Grange, Sholden Lodge, Winchester House, Beresford and Maristhorpe (Beach Street). Many Belgians were in-mates. Glack House was used as a Canadian convalescent Hospital and Warden House School was a Red Cross Hospital. Winchester House School in Golf Road was also used. Charity committees were set up and local organisations raised money for the Prince of Wales Relief Fund. 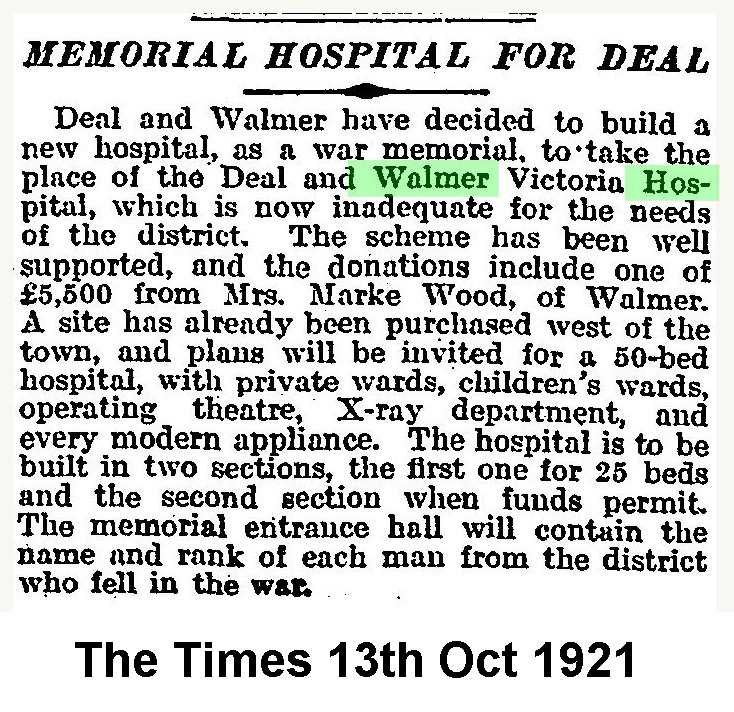 Further sums were raised to finance the war – a total of £432,000 from Deal & Walmer for purchase of Victory Loan War bonds. In recognition of this outstanding effort the town was presented with a WW1 Tank that saw active service. It was located on the promenade side of Deal Castle. The main local newspaper – the ‘Deal Walmer & Sandwich Mercury’ - collected the names of those who joined up and published a ‘Roll of Honour’, covering ten local parishes. This is about the only source available to get a true number of the men who left Deal to join up. However, names were put forward of men who no longer lived in the Deal area and had not for some time. Obituaries of the fallen were also published. Later, all this information was published by the newspaper proprietor, T. F. Pain, as a collected volume in the 1920’s. Deal suffered more than most because of the Royal Marines base at the barracks. Quite a few of the men who enlisted from Deal ended up in the Marines and they were involved in the Gallipoli campaign with tremendous loss of life. Household supplies were a problem. There was initial panic-buying at the start, in August 1914, followed by a relatively calm period. Food was being brought across the Atlantic from USA and Canada, but then the U-boat campaign became effective and shortages were apparent in basic foodstuffs. People were encouraged to turn every available bit of land over to growing food. There were 3 million extra acres in Britain at the end of the war in food production. Rationing was introduced in January 1918, first for sugar then meat, butter, cheese and margarine. Everyone had to register with a butcher and a grocer. After the attempt to save Antwerp in October 1914 many thousands of Belgian refugees arrived at Folkestone and Deal residents took in 1500. They were welcomed with open arms, spread out in the community with offers of housing. They made quite an impact as they were doctors, teachers, lawyers etc. A year later by decree, no more refugees were to be accepted in the South East. The local Belgians gradually dispersed through the country. A generation was lost and people vowed ‘never again’. 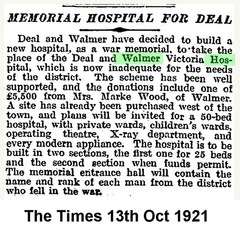 There was sufficient need for a great local memorial so, in addition to each of the churches creating memorials, there was built, made possible by local subscriptions, the Deal & Walmer Memorial Hospital, opened in 1924. It contains the Roll of Honour for Deal & Walmer - boards with all the names of the fallen for WW1. There are visible memorials at the following churches: St George’s, St Leonard’s, St Saviour’s and St Nicholas, Sholden. There are 124 fallen buried in the Deal Cemetery, Hamilton Road. However, many of these did not originate from Deal. The Naval Infirmary was used to tend to the wounded (mostly Marines) and the many who did not survive were buried here. These graves are maintained by the Commonwealth War Graves Commission. The impact on the local population did not stop at the end of the war – many women, who found they could do useful things during the war, did not want to go back to the life they led in the past. Many families were changed forever; the returning men-folk had suffered terribly and were changed. In our research, we have found that much cross-referencing of the available material needs to be done, and further research is necessary to ensure, to the best of our ability, that everyone has been accounted for. There are minor details which do not tie up between the available sources, including the use of familiar names. It is not easy when there are 60 men with the same name on the Commonwealth War Grave Commission website! There are still people listed that we are unsure of their Deal connection. It may never be possible to sort out the details. “The Long, Long Trail”. 1914-1918.net 2012 Web. Chris Martin. "Rationing and World War One". HistoryLearningSite.co.uk 2005. Web. “Kent VAD”. kentvad.org 2012. Web. Hazel Basford.